The market of Chichicastenango is home to what is undoubtedly the most colorful native market in North and Central America, and perhaps in the whole Americas. Lake Atitlan is considered one of the most beautiful in the world by many, including the famous novelist Aldous Huxley. Tours only operate on Thursdays or Sundays because those are market days. You will be picked up from your hotel in Guatemala City. We will take the road to the Western Highlands, the region of Guatemala that most travelers think about when daydreaming about a trip to this country. The region is home to quaint and colorful mountain villages, highland lakes, pine forests, and the majority of Guatemala’s indigenous peoples. Arrive at Chichicastenango Market and begin your walking tour inside the market. It is the center of the town and heart of commercial life for “maxeños” (name given to the natives of Chichicastenango, derivative from Max that means Tomás in Quiché language). The merchants go down every Thursday and Sunday to the central plaza to sell their products in this impressive indigenous market that has changed very little throughout the centuries. Explore the pathways of the market and view the colorful handicrafts and produce offered by the local people of the region. In Chichicastenango, we will also visit Santo Tomás Church, built in 1540 over the base of an archaeological pre-Hispanic temple. This church is a splendid example of colonial architecture, as the Mayan and Latino influence is mixed throughout both the interior and exterior of the building. Then, continue to the town of Panajachel, which sits on Lake Atitlan. Visit Santander Street and enjoy a spectacular view of Lake Atitlan, considered one of the most beautiful lakes in the world. 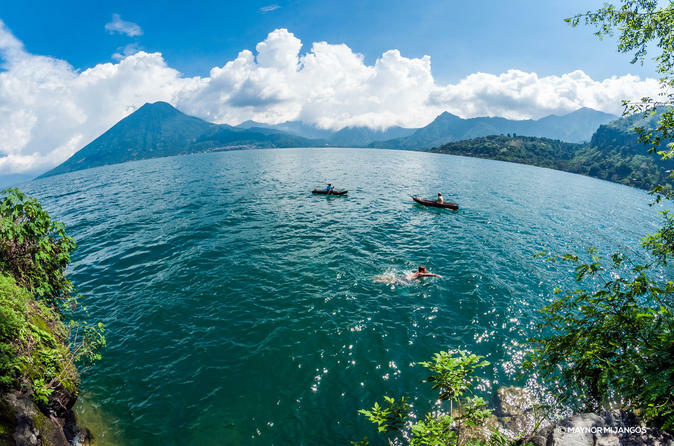 Three spectacular volcanoes, Tolimán, Atitlán and San Pedro form the natural frame of the lake itself. It has a surface of 125 square kilometers and sits 1,560 meters above sea level. In the afternoon, enjoy a relaxing return transfer back to Guatemala City. Take note the order of the itinerary of this tour can vary, sometimes we visit first the Lake Atitlan and then continue to Chichicastenango Market.